Klasinski Clinic Orthopaedics is pleased to announce that patients with insurance through Security Health Plan, no longer need a referral from their primary care provider to see one of our Doctors or Physician Assistants. Last year, Security Health Plan started a policy that required all patients that have Security Health Plan insurance to first see a primary care provider for knee, hip or wrist/hand pain that was not caused by a very recent injury. After a certain amount of treatment they could then be referred on to an orthopaedic doctor. This policy is no longer in effect for Klasinski Clinic Orthopaedic patients. 1. It takes time for everyone, including area physicians and clinics to get this information and understand how the new process works. 2. As far as we have been told by Security Health Plan this new process does not apply to all orthopaedic doctors in the area. It is our understanding that Ministry orthopaedic doctors still fall under the old policy and a referral will be needed to see them. BUT even if you, the patient, have a primary care doctor at Ministry you can still be seen at Klasinski Clinic Orthopaedics without a referral. If you, the patient, would like to be seen by one of our orthopaedic doctors for a recent injury or continued care following surgery with us in the last 12 months, you can be seen at our earliest appointment…many times during the same day. If you, the patient, would like to be seen for knee, hip or hand/wrist pain that has been bothering you for some time now, please call our office and we will set you up for an appointment. We will walk you through the process, which is very simple to complete. Our goal is to make it simple and easy for our patients to be seen when they need it most! 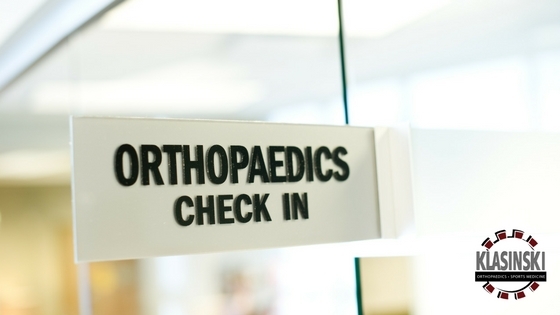 We are happy to do what we can to be able to reduce the amount of time it takes for you to get in to see an orthopaedic specialist at Klasinkski Clinic Orthopaedics. If you have any questions please contact our office at 715-344-0701 and one of our excellent staff members will answer any questions you may have. As always we are happy to provide WORLD CLASS TREATMENT…HOMETOWN CARE!